As if it isn't bad enough that Basil is impersonating Sherlock Holmes and living under his house, he's probably stealing his food too! 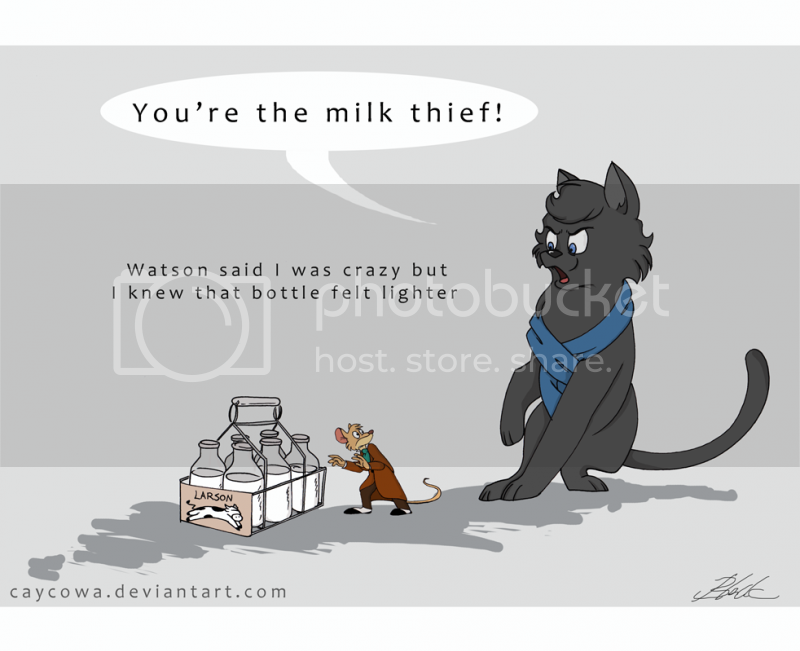 Or since Sherlock is in fact a cat, his milk. He's the milk thief! It's ever so useful when the Thought Train arrives at a hilarious destination. Sure beats the hell out of a Brain Train derailment. I'll leave it up to you whether Watson is a talking dog or if it's some sort of Jon and Garfield-type scenario. The quote is from The Big Bang Theory, you can watch a clip of that scene here. Disney's The Great Mouse Detective is based on the Sherlock Holmes stories- haha just kidding it's based on Basil of Baker Street by Eve Titus.